Booking a business trip through Upside? Link your Expensify and Upside accounts to automatically send Upside receipts to Expensify for easy reporting. Log in to your account at upside.com. Click on the “Expense” tab. If your Expensify email is different than your Upside email, in the alert box click “Expensify’’s instructions” to add your Upside email as a secondary login in Expensify. 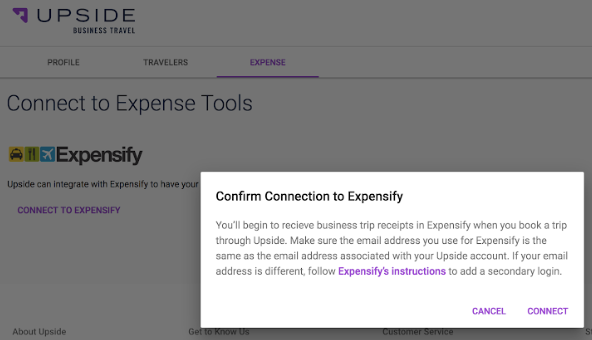 Once your accounts are connected, Upside will send your trip receipts straight to your Expensify account.